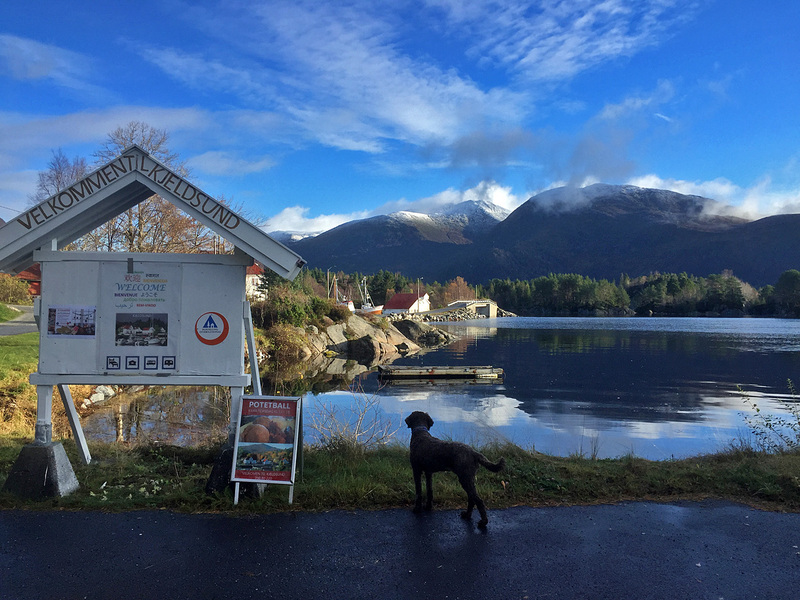 Monday: The week didn’t start out too bad, and Karma and I had a nice trip to Osnessanden beach in Ulsteinvik during the lunch break. But then it started to rain. And it kept on raining. 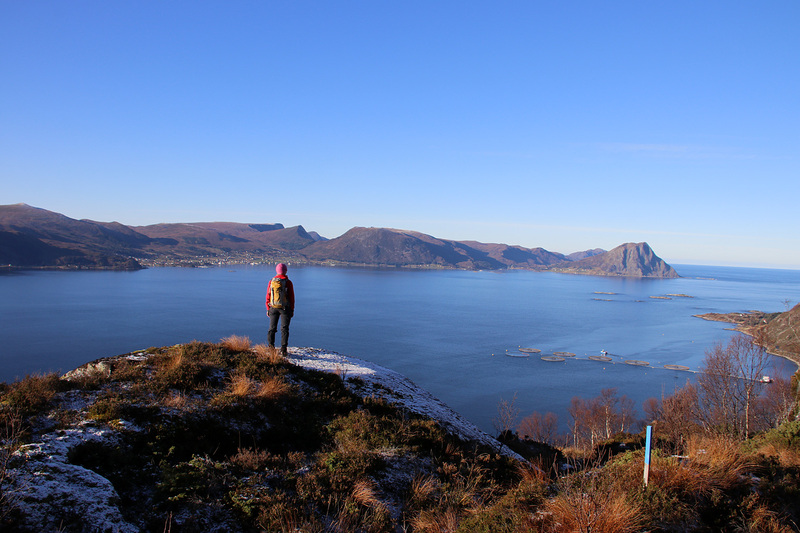 The inspiration for a proper hike was non-existing, and that’s when we go to Rambjøra – our very local mountain. The hike begins at the front door. I decided to take the opportunity to bring the hedge trimmer and do some good on the trail. 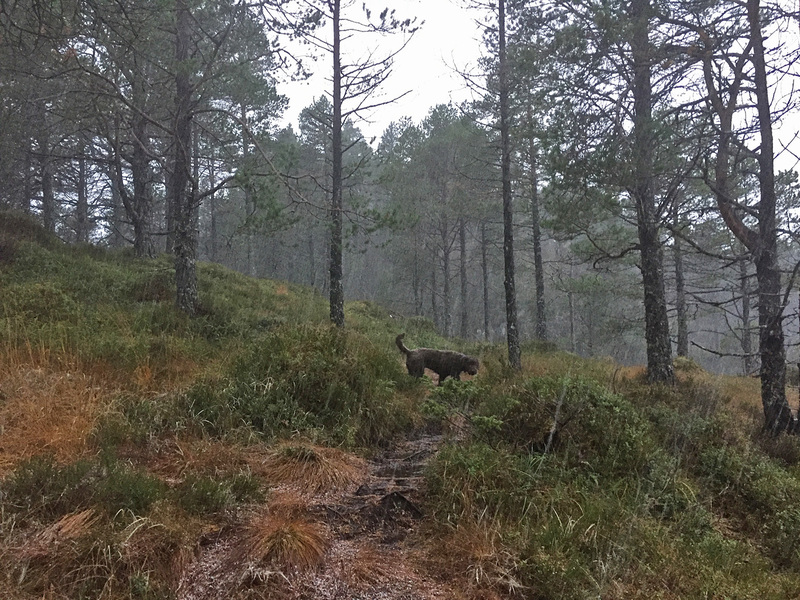 The path to Rambjøra is in the process of getting overgrown. I felt good about clearing up at least a few parts of the path. 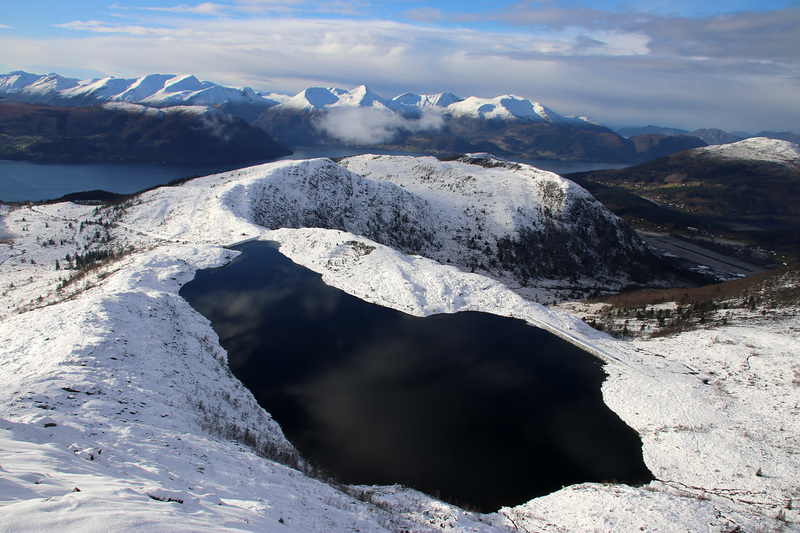 Tuesday: Ålesund day, and after work I wanted to visit Meraftafjellet again. 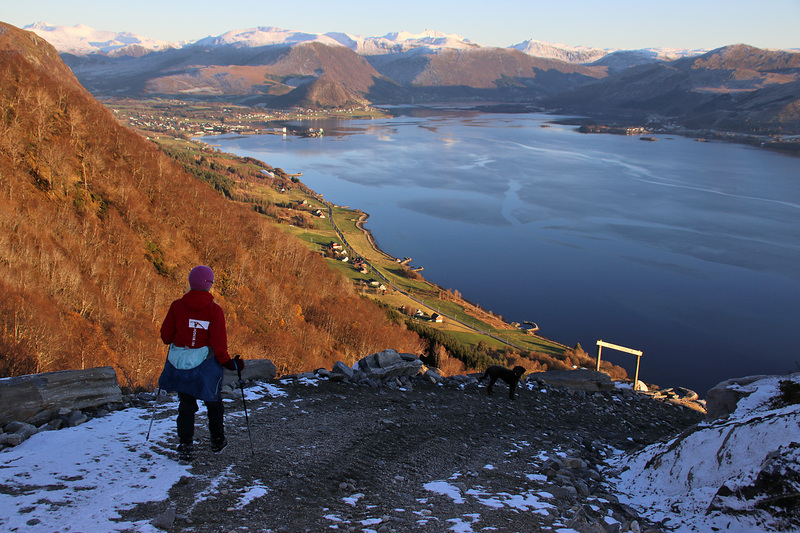 This is the highest top on the Uksenøya island outside Ålesund. 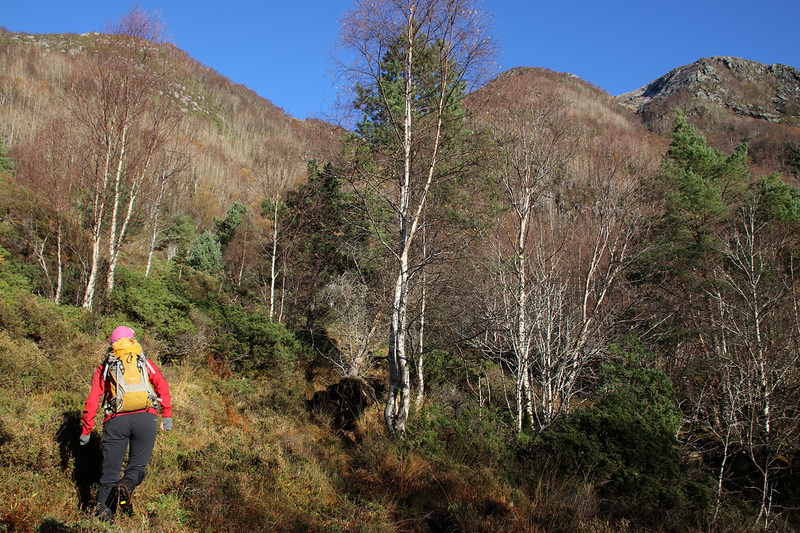 I wanted to explore a path from Glomset – one I was pretty sure I hadn’t tried before. 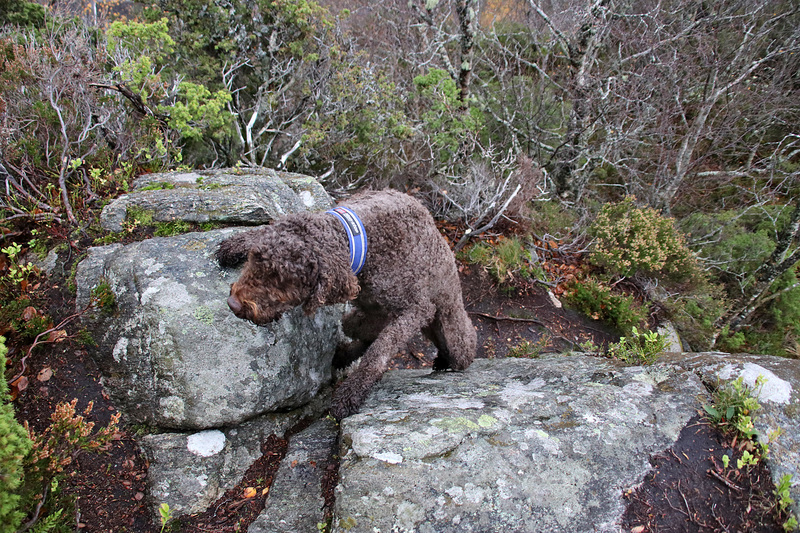 And I’ve tried my fair share of routes on this mountain. But the main goal for the trip was to stick my head out. It was hail shower day, and it’s pretty nasty up there in the middle of a hail shower. I know from experience. Not that it’s bad for me, but the hail is a severe pain for the dog. Especially when she’s not wearing her suit or some other form for protection. 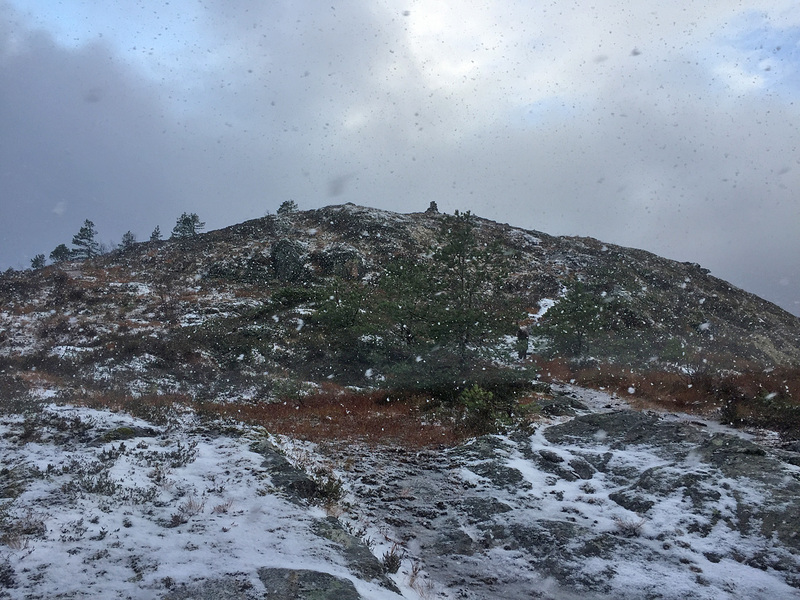 We would be safe in the forest and the plan was that if we were in the clear when we reached the plateau, we would run the remaining 0,7km to the summit cairn. If a hail shower came along while being on top, we would plunge straight south, quickly into the forest. If not, we would take the same route back down. And this would surely be the last time I walked this “path”. 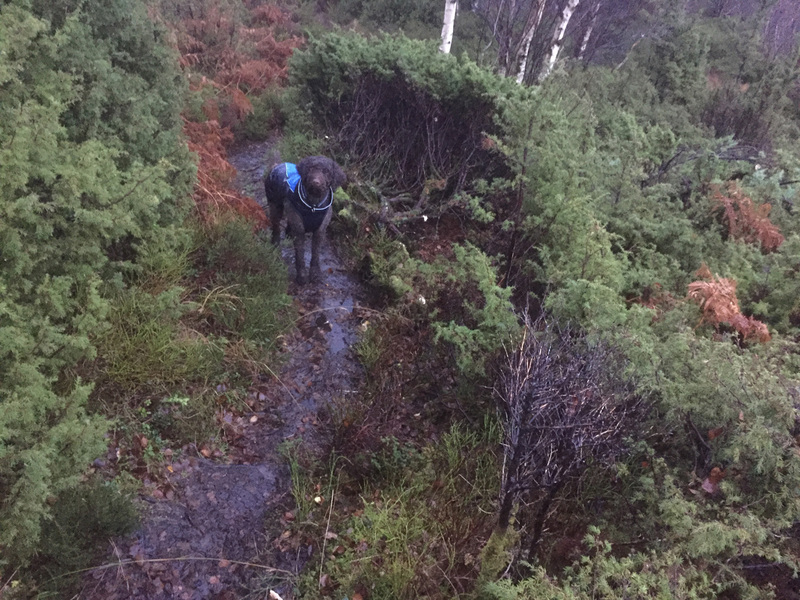 It was hardly a path at all, and at the first meadow, I lost sight of it and got soaking wet from having to cross a boggy area. 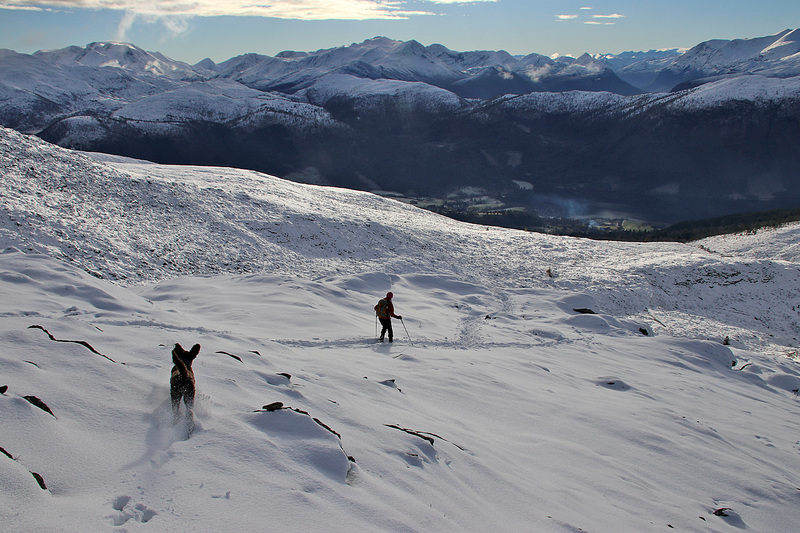 But eventually, we arrived on the forest ridge and picked up the main path. We got the hail shower in the forest, but it wasn’t too bad. I know how Karma behaves when she’s uncomfortable, and she was, by any measure, not. 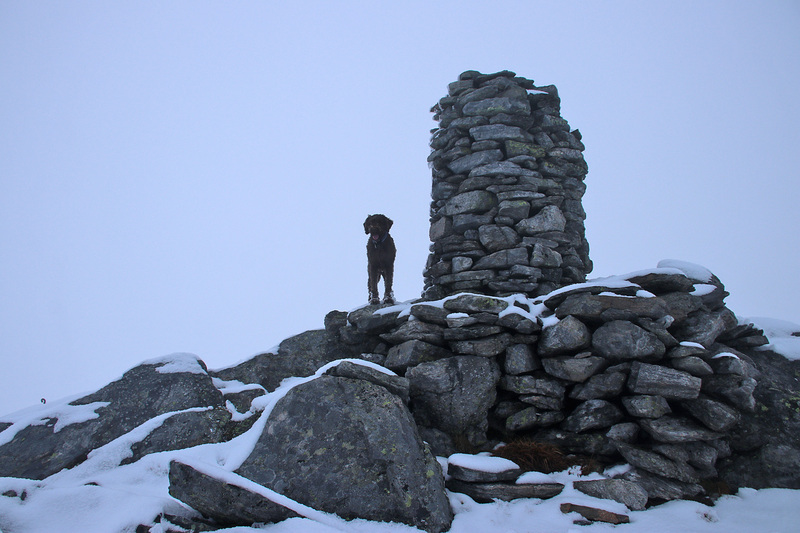 And then we came to the 518m cairn, I had to make a decision whether we should make a run for it or not. 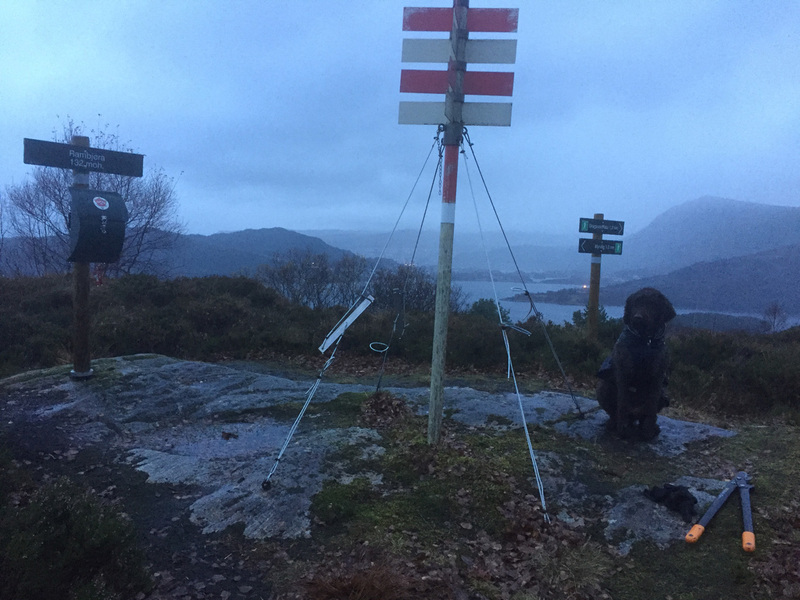 It was windy up there, and the snow now felt like hail. I decided that the weather was within “acceptable parameters” and it was a GO! Our journey across the plateau was not fun. 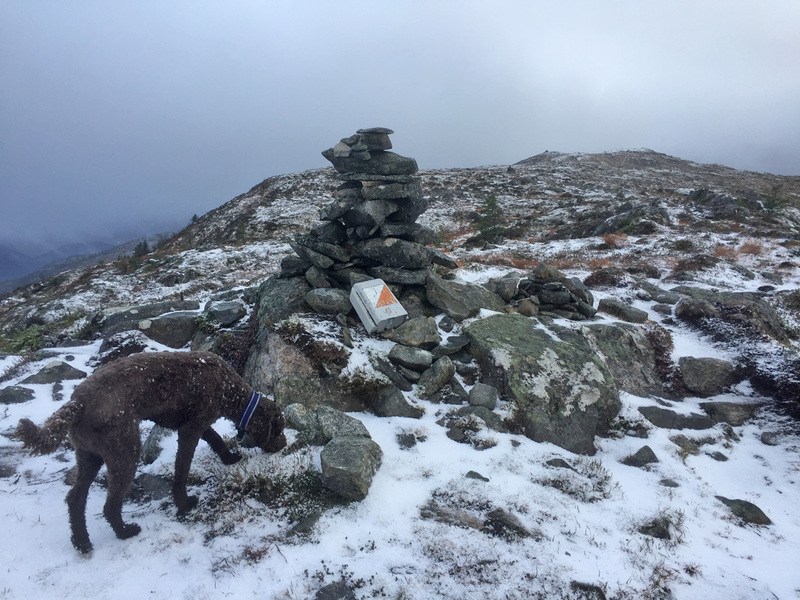 We ran all the way, and Karma immediately found shelter behind the cairn. On the way down the forest, we reached the trail fork in a small valley. 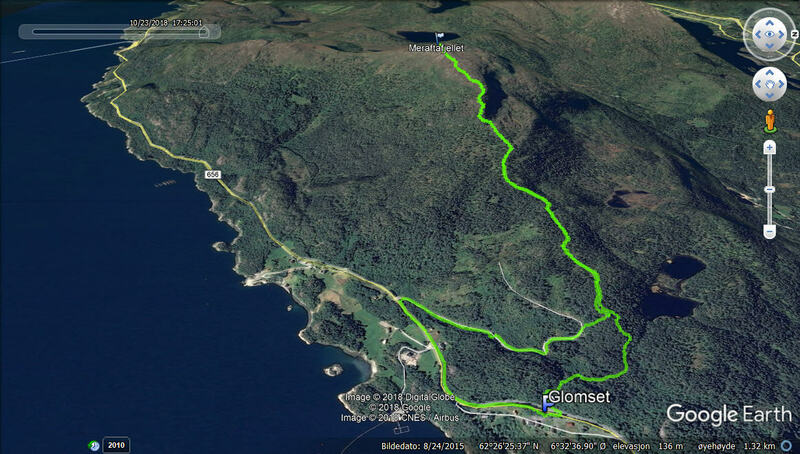 I could have gone left and ended up at Glomset, but I turned right and ended up down by Gudmundset – with 0,7km along the main road, back to the car. 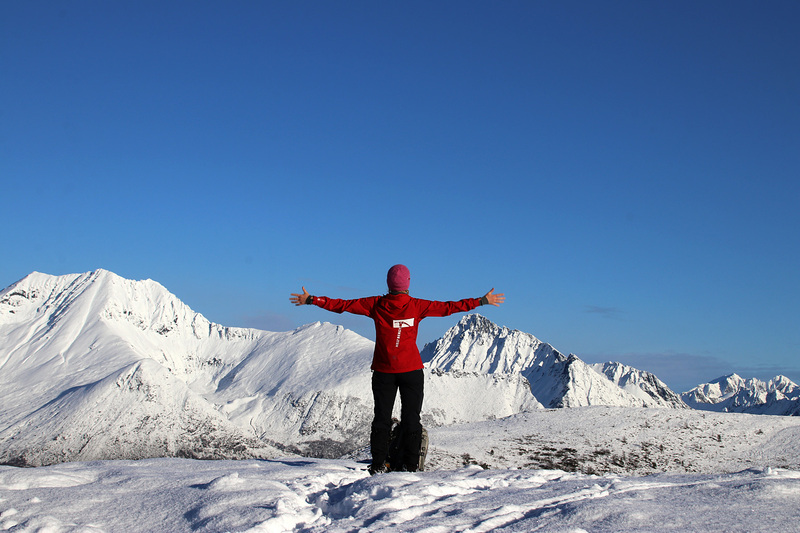 An uneventful hike, that I will remember for a long time. 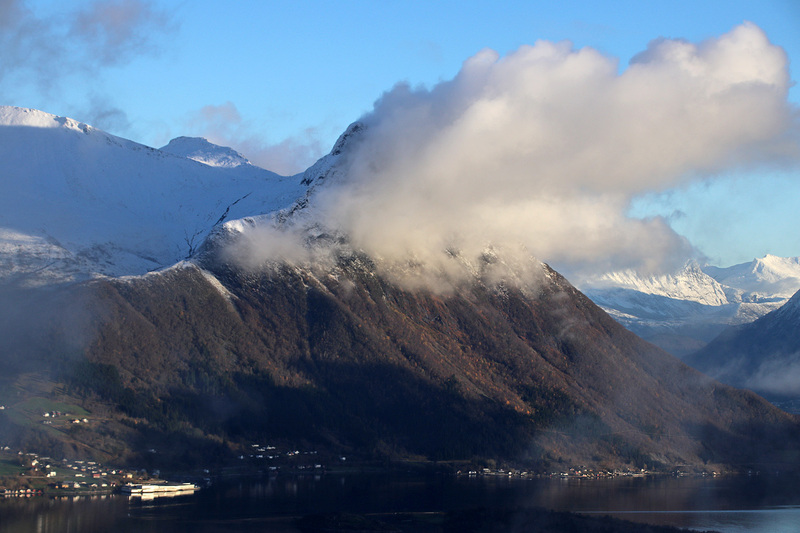 Wednesday: Ålesund for the second day in a row. 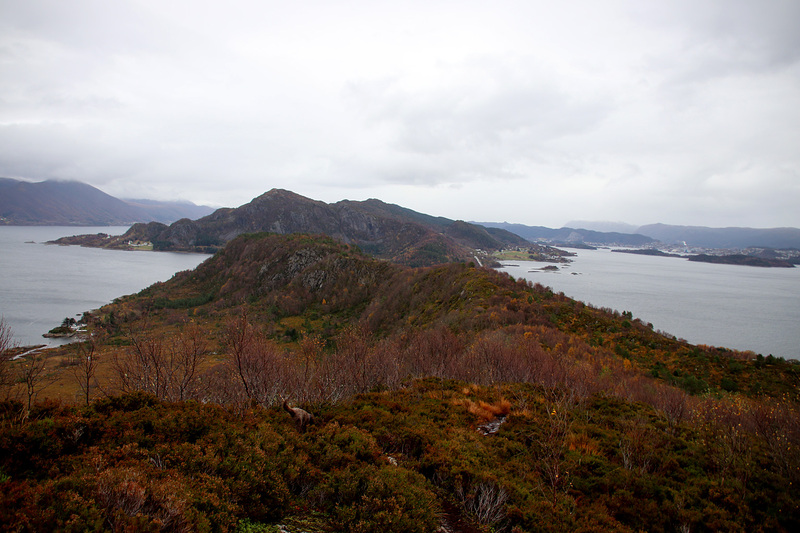 After work I drove to Ellingsøya to hike Kverveaksla – a top I hadn’t been to for at least 10 years. 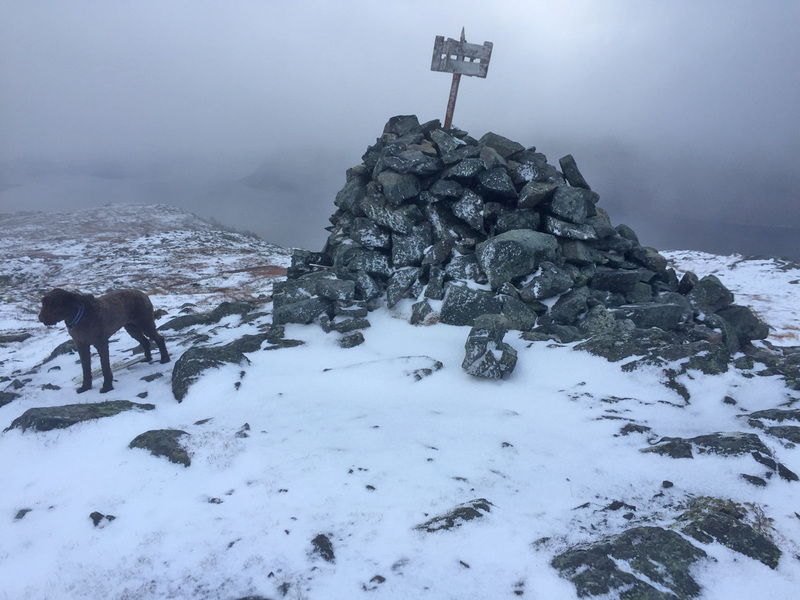 The weather was still not very inspirational, but the motivating factor was to visit the Storhaugen hump, further east of Kverveaksla. I hadn’t been there before, and when you’ve been to all the primary tops in the region, why not go for the secondary ones. 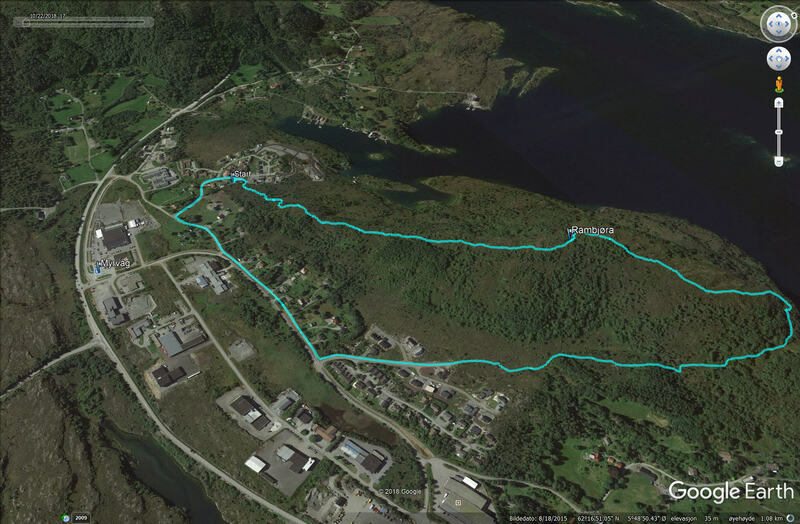 I parked by the Hovland school and followed signposts that led me to a path up the forest. The hike up to the top was short. I gladly admit that. But it was nice to be back. 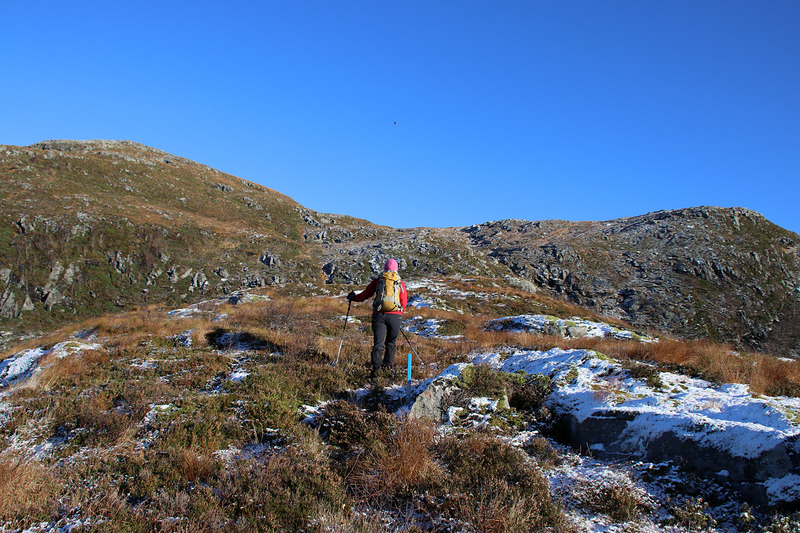 Next, we headed across the plateau in the direction of Storhaugen. 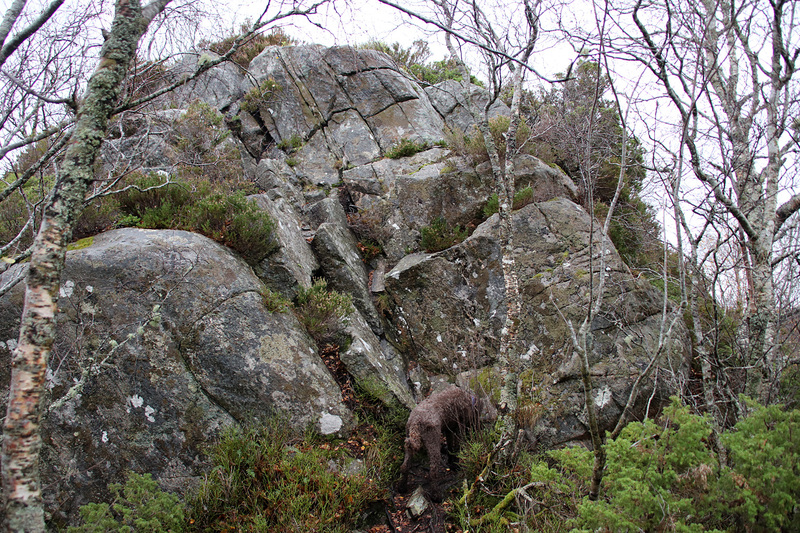 To my delightful surprise, Storhaugen offered a nice scrambling challenge for Karma. Initially, I didn’t think she would make it by herself, but by utilizing every claw she had at her disposal, she made it up. Just! 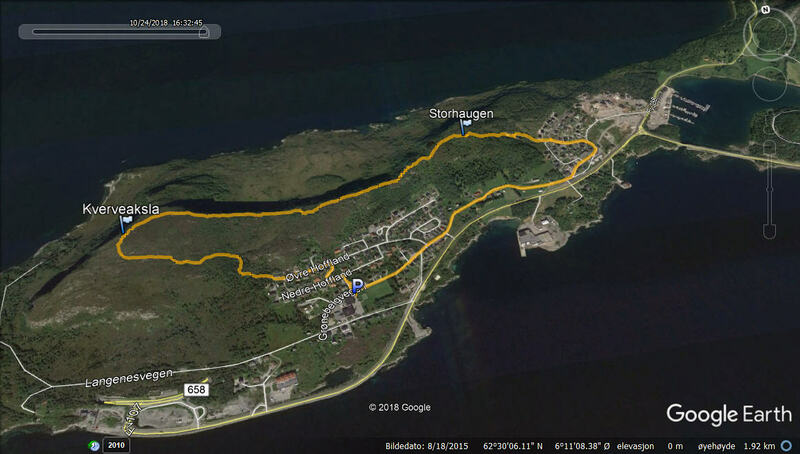 We continued the eastern path down to Hov and followed paved roads back to Hovland. Thursday: The bad weather was starting to get on my nerves. I need a sunny hike every now and then in order to stay a happy dude. 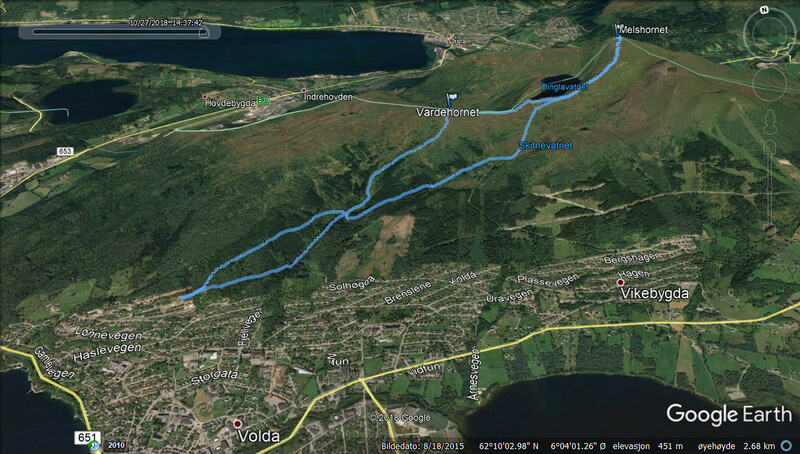 So I ended up in the Huldrehornskogen forest once again, continuing with my trail work. The upside was that progress was now quite visible. 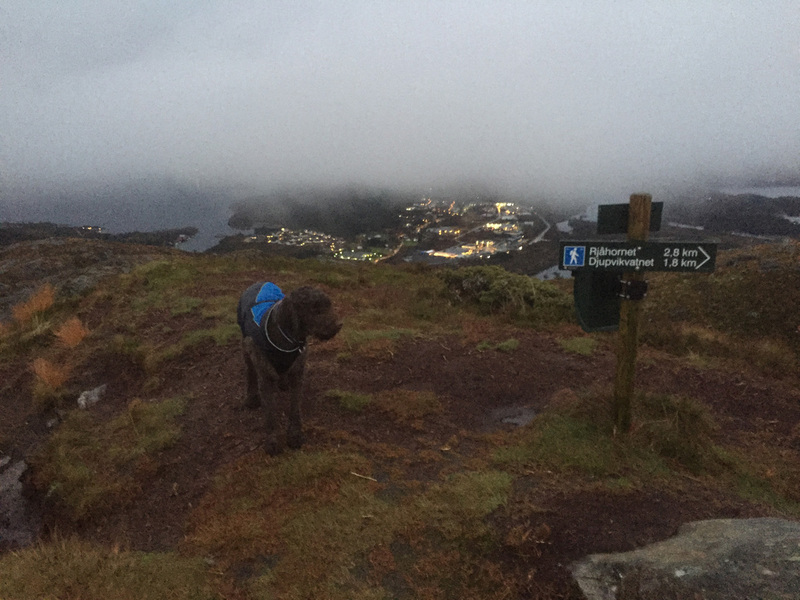 And afterwards, we went across Huldrehornet before calling it a day. Friday: Finally! The return of sunshine! 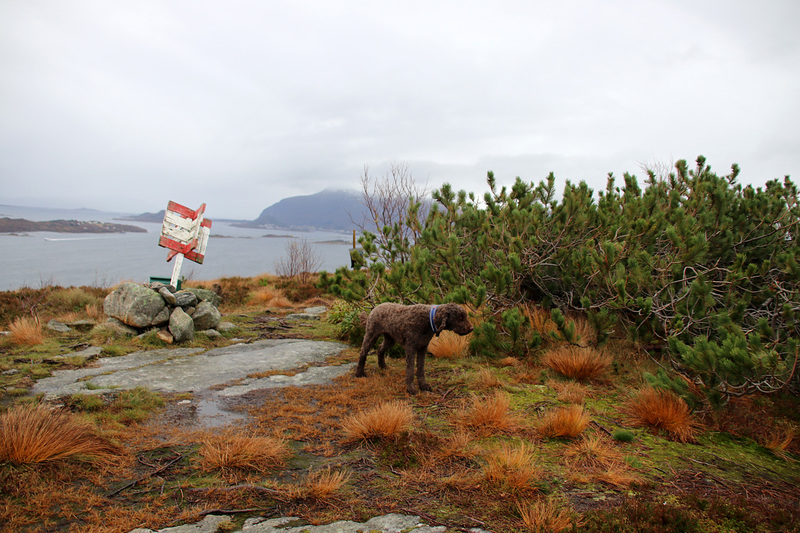 During the lunch break, we went to Kjeldsund for a little walk. 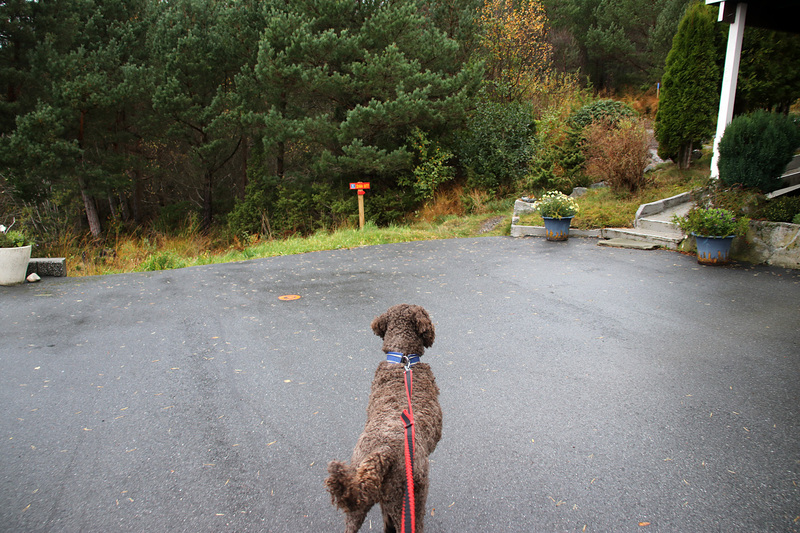 At Kjeldsund. 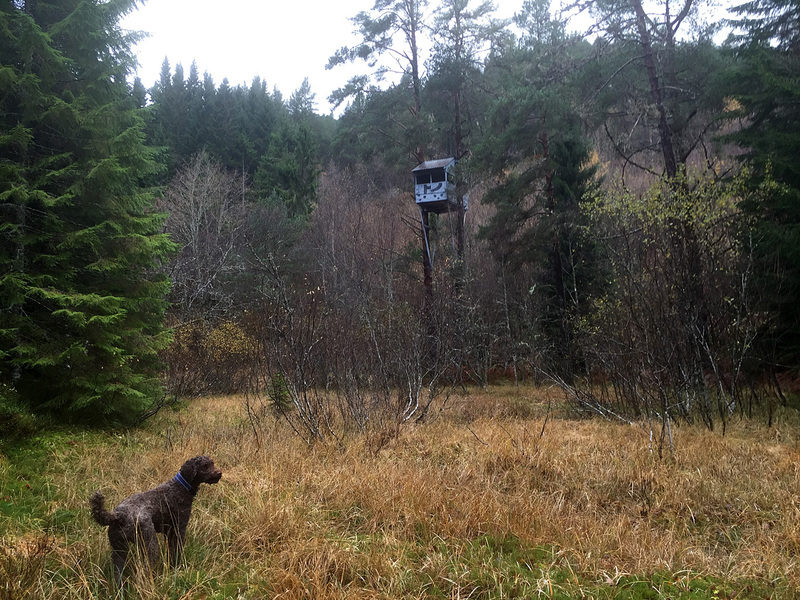 Blåtind in the background. 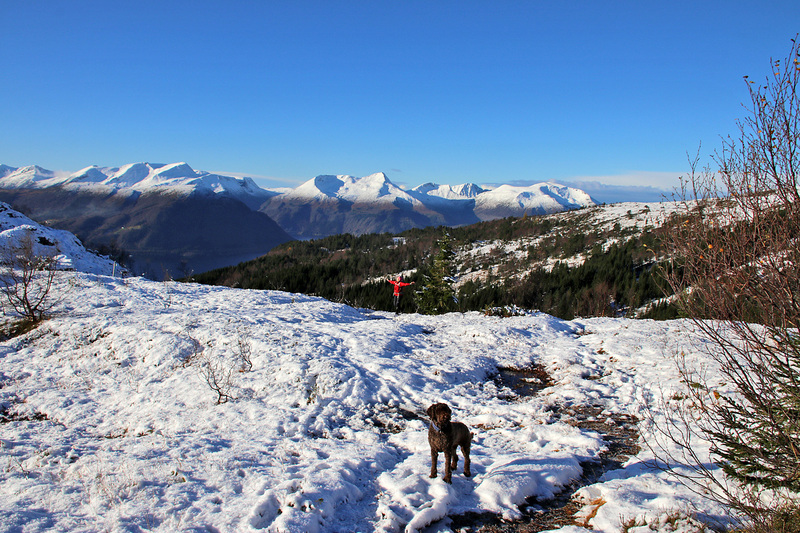 That would be our afternoon hike! 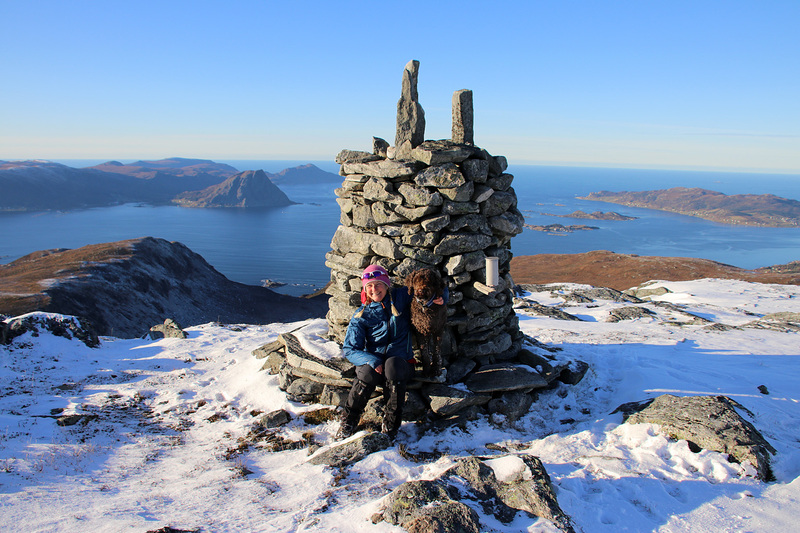 Exactly one week since we last visited Blåtind (via the Svenskevegen route), we were back again. 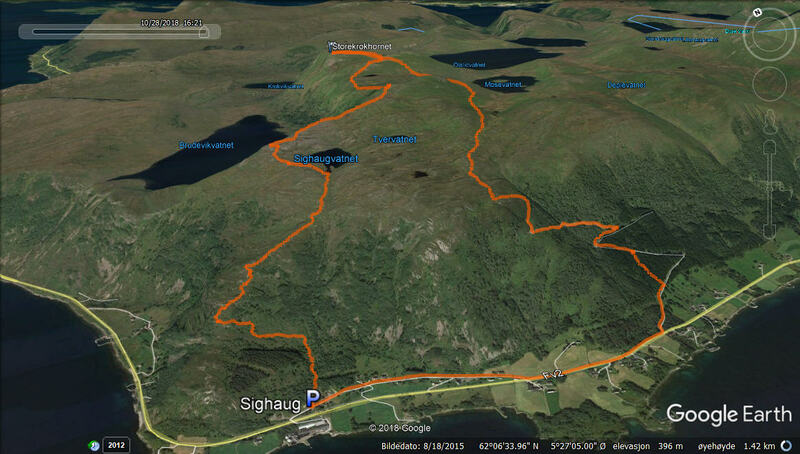 This time, we would do my favorite route from Havåg. Karma doesn’t care where we start. 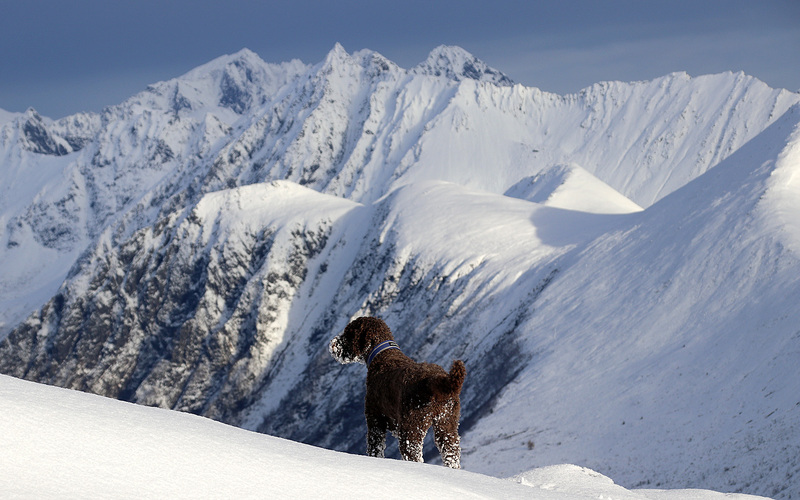 There are HARES on this mountain, and that’s all that matters. And my yearning for sunshine was finally satisfied. 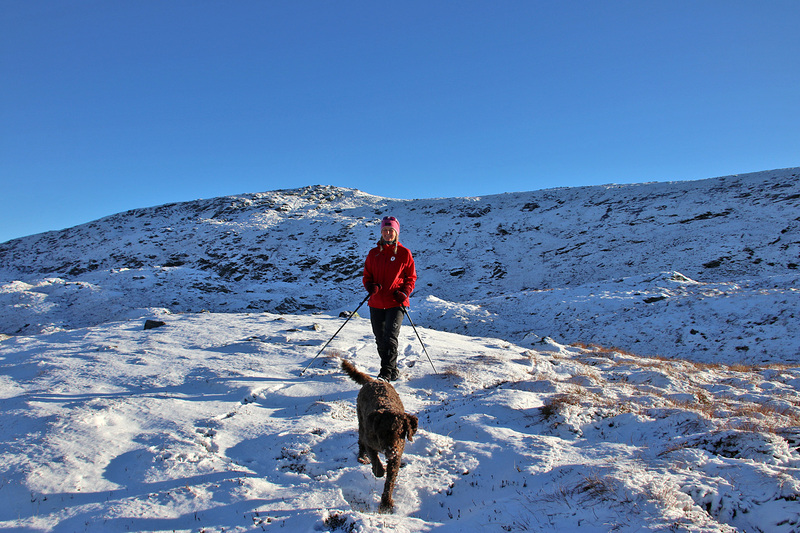 Not that a would call this an entirely sunny hike, as there were definitely elements of weather. But of the good kind. 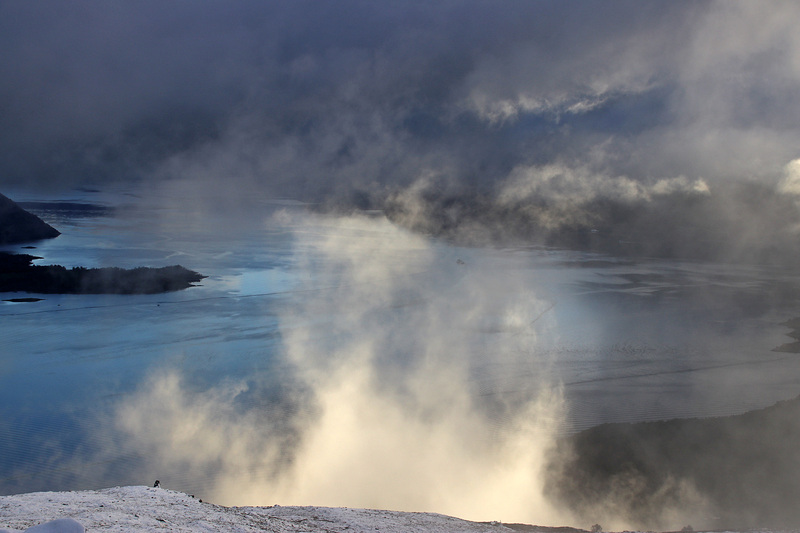 Unfortunately, we had fog on top, but it didn’t really matter. The walk so far had been downright gorgeous! 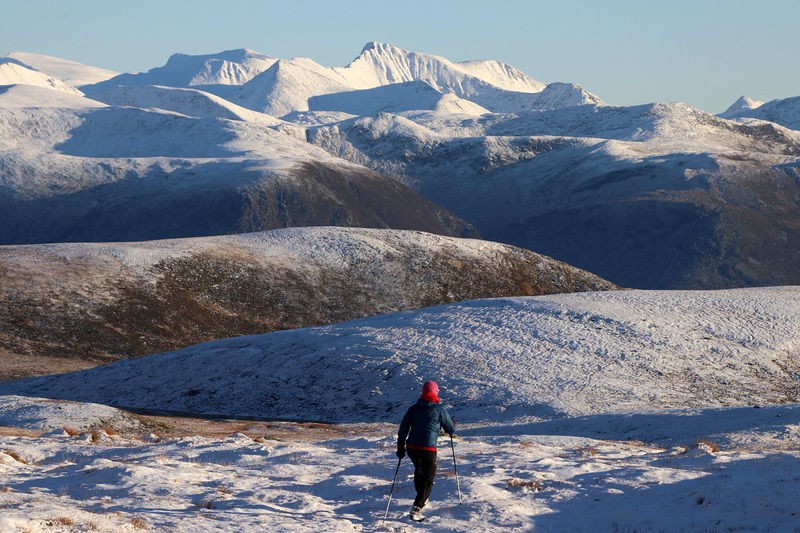 Seemed like winter was on its way, but we are not easily fooled in these parts of Norway. 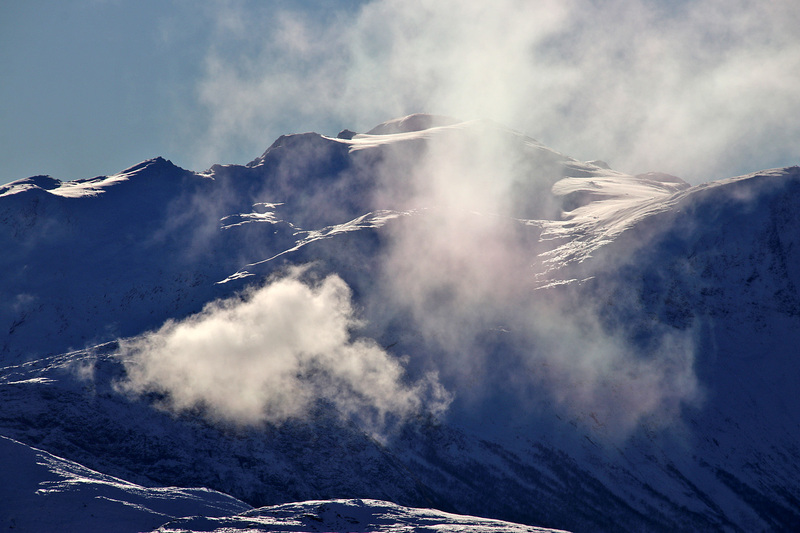 Snow comes and goes numerous times before it settles. Karma is onto something. A hare? 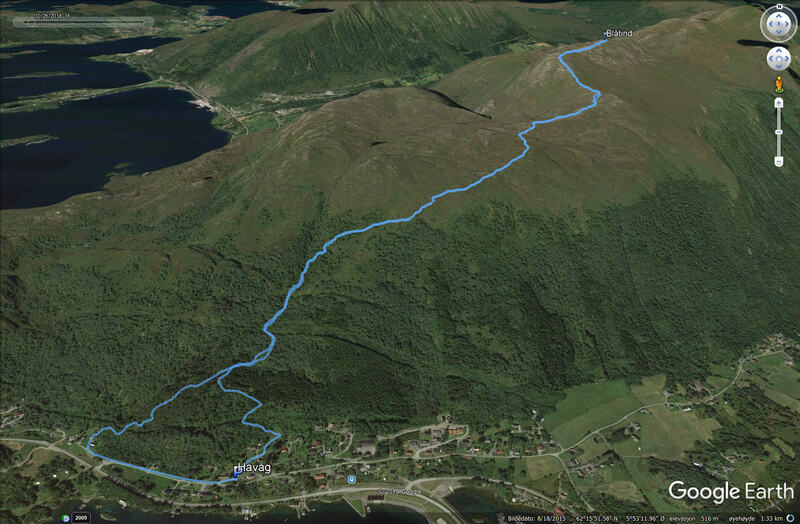 Saturday: Anne came to Sunnmøre the day before and today we drove to Volda to hike Vardehornet and Melshornet. Sunday: The hiking week ended in Vanylven, where I invited Anne for a hike to Storekrokhornet. Which I hadn’t been to since 2009. 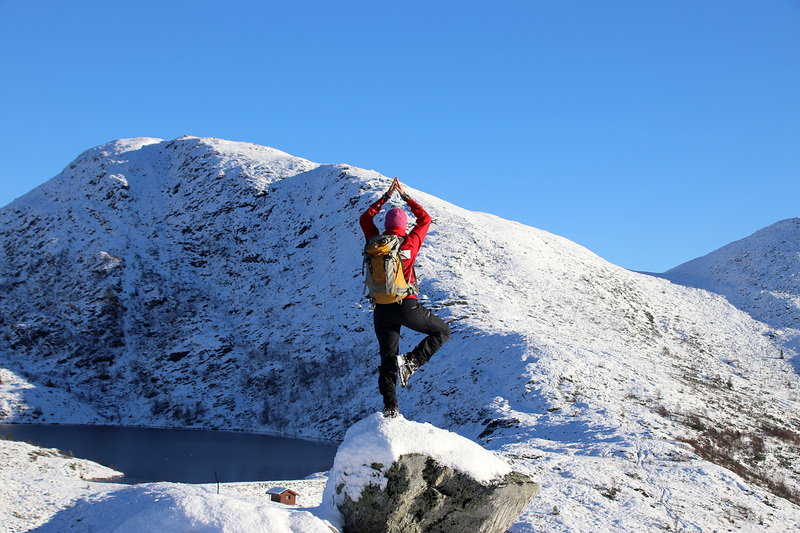 Anne was low on energy and considered turning around by lake Sighaugvatnet. I talked her into trying some more. Perhaps her energy level took a positive turn. One step at a time. Perhaps up to Litlekrokhornet? 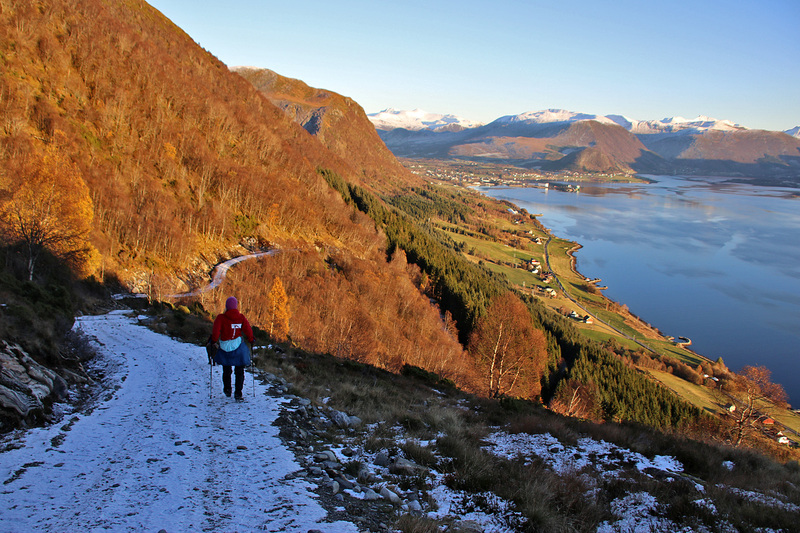 It was a boring thought to return the same way, so we decided to descend the valley between Tinden and Litlekrokhornet. Taking a different route down. Nice view! This route led us to the top of the ultra-steep forest road, where I would never ever drive down with any form of vehicle. I’m not even sure if I would have biked down the top of this road! 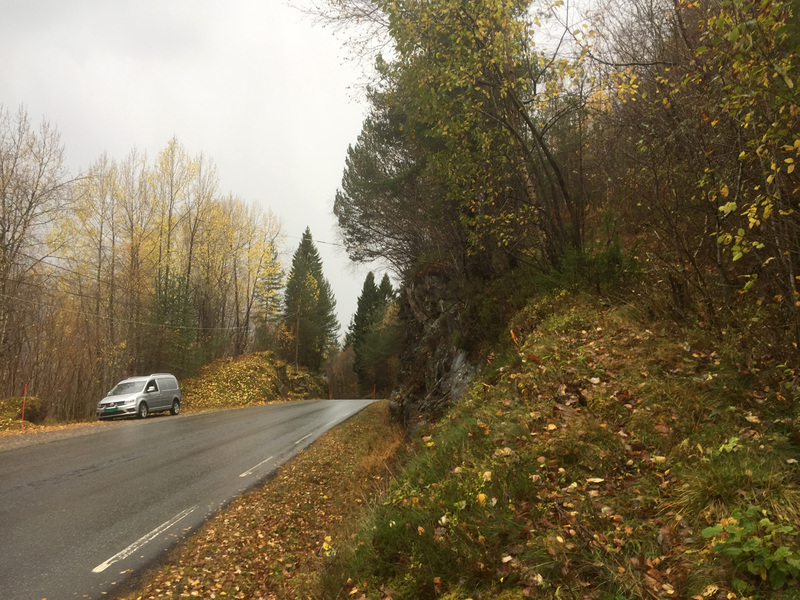 But the road soon turned into a more normal grade and we followed it down to Hundsnes, where we was 1,4km away from the car. 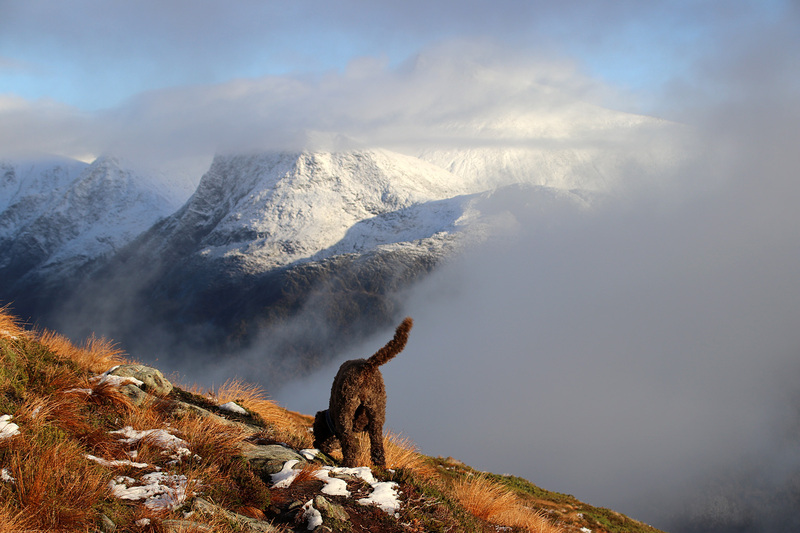 The week started somewhat depressing in terms of the weather, but ended on a very, very good note!